If there’s one thing you must make time for while traveling through Vietnam it’s visiting some of best cafes in Saigon, the Workshop. At a place where the coffee culture is life, the city is experiencing serious and fast growth in the number of eclectic and unique cafes that are a world away from the traditional street cafes. Everything from cafes that serve coffee, fashion and art side by side to quirky and quiet getaways that feel more like an Adventure in Wonderland. Vietnamese iced coffee is the constant but where you sip it is a whole other question. One answer to that could be The Workshop (Tripadvisor). Located at 27 Ngô Đức Kế, Bến Nghé, Hồ Chí Minh, Vietnam this hidden gem of a coffee house is impressive even by European or American standards. Like most great cafes in Saigon the small entrance is hidden in plain sight and you know the saying “good things are worth waiting for?” Well, with three full flights of stairs to get to The Workshop you’ll definitely be waiting and working your way to the best serious coffee lover experience ever. As you ascend up the stairs every step in the beautifully designed space is flooded with natural light. The higher you hike the more of a welcome you receive with a cooler kiss of air conditioning. This blast of refreshing air could be reason enough to head up the stairs alone. A fact I know my fellow travelers will appreciate. Of course, the real reason is the coffee and we haven’t forgot that. Once you’ve made it inside The Workshop it’s pretty clear every step was worth it. Quickly becoming known as Vietnam’s first specialty coffee bar, The Workshop takes Saigon’s respect for coffee to the next level by blending science, art and passion in pursuit of the ultimate brew. 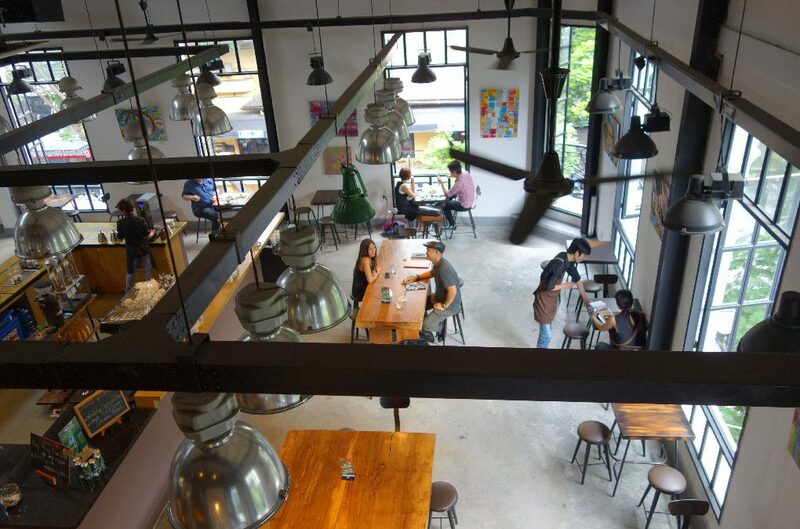 The café is situated in a gorgeous and roomy airy loft-space. It feels, in fact, a universe away from the streets and alleyways below. The Workshop’s massively elegant French door windows open the café up making you feel like you’re in coffee heaven. The high ceilings create a modern atmosphere and those panoramic views of the city streets are priceless. Consider staying for a while and get comfortable at their robust wooden tables that make a great work space for the day. The vintage stools are surprisingly comfy and the mere fact that it’s an open coffee bar concept makes you feel even more a part of something really special. As for coffee, your wish is their high quality hand crafted command. Every wish, that is, except for Vietnamese iced coffee as this place is “for serious coffee drinkers only”. But if you’re particular on your type of brewing method or are curious to try something knew they have the equipment, locally sourced beans and talent to create. From Chemex, pour-over, Aeropress, to espresso and more it’s a coffee lovers dream. No matter what way you take it the coffee delivers on all its promises. This is no doubt in large part to do with their highly trained staff of barista’s. Not only do they look the part with their authentic “workshop” aprons but there skills are on point. Making this one of the best cafes in Saigon is the bonus that they also serve a decent plate of food. It’s good to keep in mind that the menu is strictly Western style which means you can expect to pay Western prices. This isn’t a big deal, especially after a few weeks of exotic travel, a hot plate of eggs, bacon and toast with your morning coffee can be the exact kind of treat you’re needing. If you’re lucky enough to be there when the owners – a team which also includes two coffee farmers -host their annual barista competition be sure to check it out! It’s an amazing display of exciting talent emerging right in front of your eyes. What’s your favorite way to brew coffee? If there’s one thing to know about Saigon it’s that the place and the people are coffee crazy. The culture thrives on its caffeine and fact is when it comes to producing their coffee game is strong. This leads to an abundance of the best cafes in Saigon that literally line the streets, alleyways and shops throughout the city. The struggle to find coffee doesn’t exist In Vietnam. A good thing by all accounts if you happen to be a coffee lover. But because there are so many cafes in Saigon some of the more unique places can easily be missed. Keeping that in mind there is definitely a coffee spot for everyone no matter what you might be into. You’ll find cafes with themes built around fashion, art and coffee and places that offer a more cool calm and collected coffee vibe. For the curious traveler who loves to delve into the creatively unexpected may we suggest a place away from the beaten path of the busy city streets? By all accounts, if the answer is yes then KuJuz Café in Central Saigon in an absolute must for you. 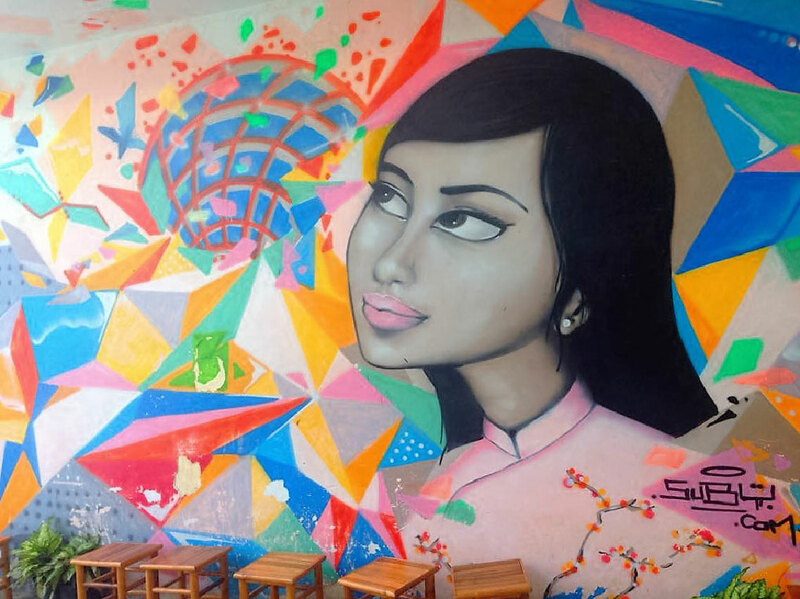 It’s not your typical Saigon café but it’s totally worth the trip. Let’s get the logistics straight first, to grab some java and a dose of culture at KuJuz café head on over to 5 Trần Quý Khoách, Tân Định, 1, Hồ Chí Minh, Vietnam. I admit when our cab driver first dropped us off I was a little confused because the area seemed a world away from what I knew of Saigon. The typically beautifully chaotic, narrow and dusty streets had disappeared miles back and were replaced by smooth and quiet roads. It was almost too quiet and desolate but when the promise of good coffee is nearby you never retreat. Never. Once out of the taxi my eyes fell on a cafe conceived for creative minds. Situated in a small, self-contained area where warehouses have been converted into artsy shops, galleries and boutiques I almost felt like I was in back LA. There was a definite “up and coming” vibe to this area. It seemed like a place that in a few years would be swarming with tourists and locals alike. For now though it was hidden gem that had been found. Nestled amongst the eclectic shops upon leading up the café the sight of a VW camper via the 1950’s immediately greets you. Next you can’t but notice the cacophony of colors that make up the shop along with an eye catching exterior. With an intention to introduce the concept of recycling to young Vietnamese the colorful doors and window frames of the café are made from reuse wood and are painted in fun and vibrant colors. Even before you’ve looked at the menu stepping into KuJuz feels like a moment where you actually get to take a peek through that magical looking glass. Inside the exterior is equal parts inviting and intriguing. The interior is a peaceful space with décor that’s just as colorful as the outside. It’s sparks a cozy and eclectic vibe that’s both refreshing and cool. There’s a definite relaxed feel to it to this café and one that after a few days amongst the busy city is inviting. It must be noted that the sturdy community style wooden tables, regal solid chairs and decent Wi-Fi connection makes this Saigon Café a great place to catch up on some emails or get some work done. There’s also seating outside and the patio has it’s a character all its own. Something akin to your own private backyard lined with greenery and even a small water fountain it’s another great option to chill out, read a book or write a postcard to someone back home. What about the coffee you ask? We’re almost there but first there’s something you need to know. One of the more interesting aspects of KuJuz is that at this café you make your own drink. It’s basically a self-serve café where, with the help of some friendly staff, you choose your favorite drink and mix it your own way. This type of business concept literally translates into an endless number of coffee and tea options literally at your fingertips. And the coffee does not disappoint. Everything you have come to expect from a Vietnamese coffee is right there for you in your tall iced glass or your piping hot mug. As if all that wasn’t enough to make this Saigon Café stand out another cool aspect is their pay system. For the most part drinks are VND50,000/glass (about $2.25 USD) but if you pay VND100,000 (that’s around $4.50 USD) you can explore and enjoy as many drink as your heart desires. KuJuz even let’s its patrons leave and linger around the surrounding shops and pop back in whenever needed to get refreshed. The whole place screams “Home away from home”. KuJuz is a definite hidden gem in Saigon (for now) and one that definitely should be included on your travel itinerary. What hidden gems to do you to offer people traveling to Vietnam? 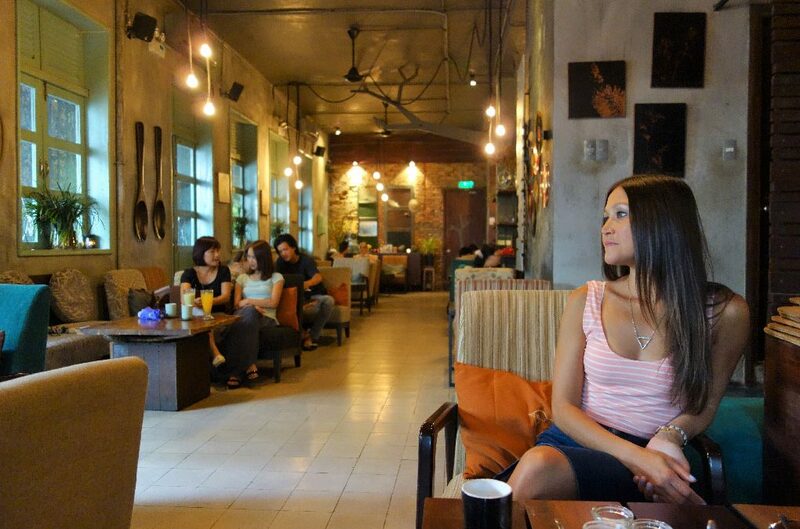 When it comes to finding the best cafes in Saigon let all of your worries go. Coffee and cafe culture is an absolute staple of life in Vietnam. Take a trip to any of the major cities such as Saigon and Hanoi and you’ll find street style cafes, Indie Cafes, a handful of Western chains and more. There’s absolutely something for everyone and with the thousands of coffee havens that are yours to explore we thought we’d highlight a few of what we think are the best cafes in Saigon to help you out. If you love fashion and art as much as you love coffee be sure to check out our last post to know where to go for your joe. We hope you’re well caffeinated and continuing on with our Best Saigon Cafes series next up is I.D. Café. 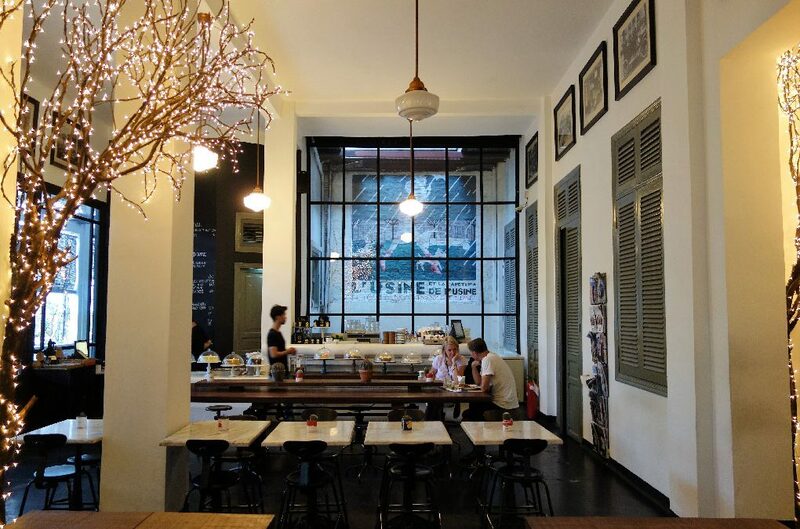 You can find this hidden gem of a cafe at 34D Thu Khoa Huan Street | District 1, Ho Chi Minh City District 1, Vietnam. We must have hit this café up at least 4 or 5 times in a single trip while in Saigon. To be honest, it doesn’t look like much from the street, but once upstairs this cool little café with lounge chairs and coffee tables, free wifi, a/c, magazines and papers to read is an absolute hidden treasure. From the first visit I was hooked to the cafe that’s tucked along the stretch of shop houses in District 1. The two-floor coffee shop has a décor that’s cozy, industrial and the perfect place to settle in. The retro style armchairs are comfy and stylish and the walls lined with vinyl records and stencils along with the lighting and music create a cool and creative atmosphere. Located just one block north of Ben Thanh Market, I.D. Cafe offers the perfect break from the beautiful chaos of the market. The coffee is great here including of course an exceptional Cà phê sua đá (Iced Vietnamese Coffee) along with cold coffee blended treats, exotic fruit smoothies and for those looking for a different kind of refreshment they serve a nice assortment of local beers, ciders, wines and cocktails. Without a doubt I.D.cafe is a must if you’re traveling in Saigon. If all that doesn’t convince you I suppose you’ll just have to bookmark this page and check it out for yourself on your next trip to Vietnam. What’s your favorite style of café? Subscribe to ChestBrew for more of the Best Cafes in Saigon and to get a coupon for a discount on our ridiculously strong coffee. If there’s one thing that Saigon has it’s a healthy coffee scene. Our own personal treks through Saigon have spoiled us with some of the best coffee tasting experiences we’ve ever had. Keeping in mind there are thousands of cafes in Saigon to choose from whether you’re looking for your morning jolt, a chill place to get some work done, a place to duck in to avoid the drench of rainy season or a simple and sweet after dinner dose with friends the choices can definitely be overwhelming. We spent quite a bit of time researching ourselves and hey, if you ever do find yourself in Saigon let us help you out. In our Best Cafes in Saigon series we’ll share our favorite cafes that go above and beyond simply serving drinks, post a few pics so you can get a feel for the ambiance and toss in some of the details to get you there and enjoying a good cup of cà phê yourself. Alright, first on ChestBrew’s Café Must Menu is L’Usine. Are you like me and love when fashion and coffee come together? Well welcome to L’USINE: Fashion, Lifestyle, Cafe,Gallery. With two locations in Saigon, the original is located at Dong Khoi. Hidden inside an alleyway with paintings and other crafts for sale this is one of my favorite places to go early in the morning for a tall and strong iced coffee alongside a yummy lemon tart. The atmosphere is so pleasant with their contemporary furniture, faux trees lined with beautiful lights, large windows that allows tons of natural sunlight in and high Victorian ceilings. L’Usine is a hidden gem and a quiet retreat from the busy streets below. Their second location a few miles away at Le Loi is another great place to refresh and recharge yourself. The cafe offers a full Western style breakfast menu with lunch and dinner options as well. Their tuna salad is delicious! Their desserts are divine and their coffee bar includes lattes, cappuccinos and of course Cà phê sua đá (Sweetened Vietnamese Iced Coffee). If you happen to be a tea drinker I highly recommend the blossom flower tea! To top it off both locations have an attached eclectic boutique where you can browse clothes, shoes, jewelry and find some beautiful and unique gifts and souvenirs. L’Usine also hold the occasional fashion show turning their café and boutique in a runaway for local fashion designers to showcase their talent. How cool is that? Keep in mind that both L’Usine locations are pretty busy from open to close but if you ask us it’s absolutely a must try at least once every trip. What cafes can you recommend in Vietnam? A staggering 100 million businesses are launched annually, according to a GEM Global Report. With that information you can understand that the idea of having a unique product is one thing. The actual execution of creating that product and bringing it to the market is a whole other challenge. Like any good business great will tell you in order to meet the needs of the market you have to be able to fill a gap that currently exists. You must believe that you have a better offering than your competitors and you have to do the hard work to create a brand that brings the best of that offering to life. We successfully identified “the gap” and figured out how to be the first supplier of 100% Vietnamese coffee to the United States. It was common knowledge that we admired hard work and that the Vietnamese coffee roasting industry we would establish would employ some the hardest workers we knew. To make the business model even more in line with our company beliefs, that coffee would be marketed to help hard working people in the Western world get stuff done. Now the task was to actually find the bean that would fit the bill. Before we first set out to find the best bean in Vietnam we knew that in order to find that bean we would have to know what else was out there. And so with a round trip ticket in hand, a couple dozen TripAdvisor bookmarks on our Ipads and a thirst for purpose we mapped out all the best cafes in Saigon. Now, if you’ve been to the capital city you’ll know this was no small feat. I mean cafes are to Saigon like the grains of sand are to the beaches of California. Despite this we committed to the idea that no challenge was too big, especially when we had coffee as our go to research resource. We narrowed down our points of caffeinated interest to specifically District 1, an area that has a population of 204,899 people and is located in the middle of the city. D1 is considered the financial center of Saigon and Vietnam and also happens to be known as the best spot for shopping in Vietnam with loads of shopping centers and fancy high end retailers. With just over 2 weeks of dozens of early morning meetings with industry experts and suppliers to attend and late nights ahead of us we were sure that’d we’d be able to get a taste of the fuel we needed to help drive our own Project of Purpose. We traveled the country and shook hands with some of the most noted players in the Vietnamese coffee game as well as some new players that were trying their hand in the market. We discussed the ins and outs, the logistics, legalities and pragmatics of the proposal. After our meetings we felt we were on the right track. It was imperative to meet with the big guys but we didn’t stop there. We knew how important the “little guys” were and how important it was to understand what the actual experience of drinking the coffee was. We explored small mom and pop owned cafes that had no more than a few colorful child size tables and chairs outside to sip and enjoy the city scenes. We took in the big 3 floor chain coffee shops that welcomed you with the most glorious blast of air conditioning. Not to mention trying the brews from the Vietnamese lady on the corner pouring drinks straight from her street cart. It was much more of an experience than I ever thought it was going to be and we learned many things along the way. 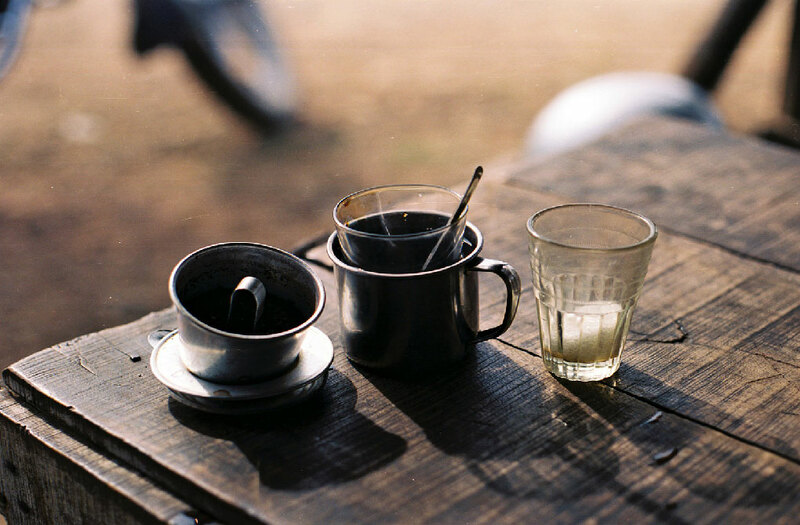 Insights such as coffee is life in Vietnam. From morning to night the locals are drinking their hot and iced coffees as the rush of the scooters, taxis and people fly by. It’s meant to be had in the morning, after breakfast, post lunch and most certainly after dinner. There is not a corner you can turn without seeing a selection of cafes that are full of customers. Which means don’t be too hopeful if you hit up a café where there are no seats available because people don’t rush their coffee time. And if you love a particular cup of coffee get your fill because unless you’re mapping out your every step you’ll probably never find the place again. Most importantly we learned that coffee in Vietnam isn’t something that people drink to power through their day, it’s not just a daily habit and it certainly isn’t taken for granted. Having coffee in Vietnam means that you’re sitting down to slow down your own perspective as the rest of world whizzes by. It’s a time of day where you sit with others for hours at a time quite possibly not saying a single word but just observing the world around you. It’s a tool to open the door to a solid session of self-reflection taking in all you can so that when you finally do rise from your chair you’re doing so having settled into your place in this world just a little more. Did we find great coffee? Absolutely, but far greater than that we discovered the “secret” to offering the best product possible. We realized that in our quest for the perfect bean rather than getting caught up in nailing down the perfect “taste profile” what we should have been doing was taking notes from the Easterner’s lifestyle. The coffee, no matter where we went was on point, that’s something the people of Vietnam have mastered. But how, where, when and with whom you enjoy it has so much to do with how that cup of brew goes down. And that’s a lesson that we’ll take refills on any day. What compels you to choose a product? Subscribe to ChestBrew for more awesome stories and for a coupon to get a discount on our ridiculously strong coffee. Vietnam is a stunning country of rice paddies, scooters, outdoor markets, good food and even better coffee. My first trip to the country, I knew very little about it but after just a week I learned quickly that travelling to Vietnam is an incredible experience. Whether you’ve been there numerous times, are in the midst of planning your trip or just have the journey in the back of your mind here’s a list of 10 things you can expect when you arrive in Saigon. The coffee is the real delicious deal! It’s no surprise considering Vietnam is the second largest coffee-producing nation after Brazil, producing 16% of the world’s total coffee (Brazil’s is 40%). A hometown favorite is the ca phe sua da! It’s a strong single filtered coffee that has sweet and creamy condensed milk mixed in and topped with ice. An absolute must for all of those long and hot days of exploring. Coming across a café isn’t hard because there’s hundreds of cafes that line the streets and alleys of the city. Road rules don’t exist. No truly, crossing the scooter and taxi filled streets calls for a strategic plan and a heartfelt prayer. Good news is that the thousands of locals who drive the narrow roads everyday seem to have a method to their vehicular madness. This means that all you have to figure out is the perfect timing to walk straight across the street. Bonus tip, once you start to walk don’t stop or worry about maneuvering around the scooters, they see you and prefer to work around you. Speaking of taxis, if you’re looking to catch a cab in Saigon keep an eye out for Mai Linh and Vinasun two of the most trusted and reliable companies. Your first look at the taxis will most likely be at the airport and from that moment on you’ll see hundreds more during your stay. Not only will the majority of taxi drivers get you to where you’re going fast giving your tired tourist feet a rest but you’ll find that the air conditioning is always on blast. Something to appreciate during those sweltering days. Did somebody say siesta? 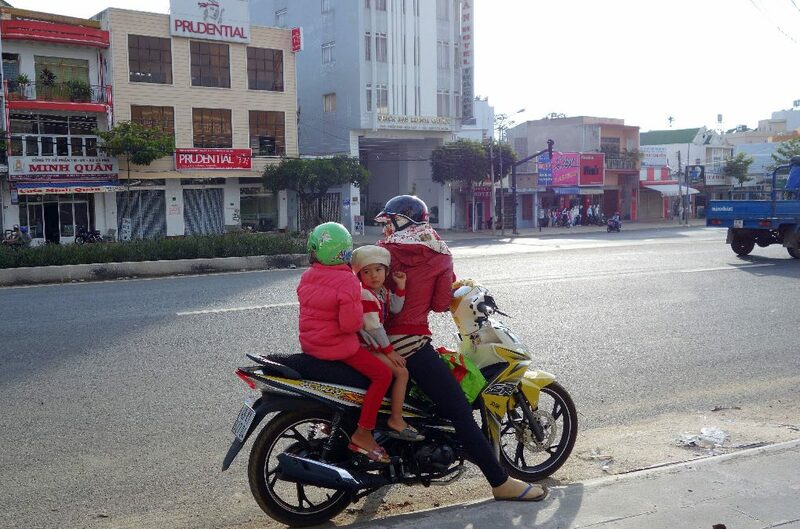 You’ll notice most Vietnamese folks take a nap after lunch. The days start early and end late for most in Vietnam, especially the busy cities like Saigon so that time to recharge during the day is a must. Some even rack out right on top of their scooters! It really is a sight to see and you can’t help but admire their sense of balance. K-POP love is strong! Teenagers have an intense adoration for K-POP! It’s seriously everywhere in part because of all of the imported Korean artists, music, fashions, makeup and accessories trends that Vietnamese young fans love to consume and emulate. Not surprisingly, this has led to the increasing popularity of Korean wave and now there are now more and more Korean language classes conducted throughout Vietnam. It’s not just the music but the culture that the youth wants to understand and embrace. Karaoke is huge in Saigon. This could be the case for many reasons including that Asians, in general, lack a reputation for expressing strong emotions, either positive or negative. Karaoke is cathartic for Asians who bottle up powerful emotions. But let’s not forget that karaokeing isn’t just a pastime that Asian adore. In fact, it’s a $380 million industry in the United States. Basically, it’s just good fun. Can I start you off with some iced tea? Endless chilled glasses of delicious iced tea is served no sooner than you sit down in most restaurants. Similar to the customary glass of ice water offered in most restaurants across North America, tea is a staple in Vietnamese culture. Of course, tea drinking has existed for a long time in Vietnam. In the past, drinking was just for noble classes but for a long time now people from all walks of life enjoy tea. It’s also a welcome greeting after stepping into the café and out from the hot and dusty streets. Party for Nguyen, your table to 20 is ready. You’ll most commonly run into folks with the first or last name “Nguyen”. Not a surprise since the name is used by about 40% of the population. (That’s around 35,600,000 people) If you’re wondering why here’s a quick history lesson. The surname Nguyen is believed to have originated in the Chinese surname “Ruan” (in the Mandarin language) or Yuen (Cantonese), attributed to China’s long reign over Vietnam. During this time the name Nguyen was either forced upon the public by new regimes or was chosen voluntarily by Vietnamese for other reasons. The night time is the right time. Vietnamese folks tend to prefer to shower at night rather than the morning. This may have to do with the fact no month in Saigon has an average high temperature of less than 89 degrees. It’s not uncommon to see the parks full of people at sunrise who want to get a good workout and stretch in before the day gets to warm. From my own time there I can tell you that it’s pretty much the best thing ever to grab a cool rinse off after a day out exploring the dusty, sweltering, beautifully chaotic streets of Saigon. Vietnamese people are honest, hardworking, and kind. The average work week in Vietnam is around 60 hours and most of those jobs are spent in factories and on farms. With exports of in excess of $162 billion (2015) there’s no question that it’s a hard working and hustle type of culture. In recent years ICT and software and tourism have seen growth in Vietnam as well. What the future holds I cannot say however I can tell you from personal experience that in Vietnam there is no lack of hospitality and kindness. What advice to so have to offer people travelling to Vietnam? Subscribe to ChestBrew for more awesome stories and a coupon to get a discount on our ridiculously strong Vietnamese coffee.